Why Isn't White Bread Good for You? Despite white bread's popularity and its benefit as a convenient, portable and tasty food, it contains very little nutrition. White bread is unhealthy, potentially fattening and could even be responsible for less-than-desirable health effects. Learn why ditching refined white flour in favor of whole grains can give you a major health boost. When you're looking for a snack, consider the limited health value of white bread nutrition. It is high in carbs and low in fiber and micronutrients — and its gluten content may be harmful if you have a sensitivity to wheat. White bread is made from refined flour. Refined grains have undergone a process that removes the germ, which contains protein, minerals, healthy fats and B vitamins; bran, containing antioxidants, B vitamins and fiber; and _endosperm,_which contains carbohydrates, protein, and some vitamins, minerals and fiber, according to Healthy Grains Institute. Most refined flours are enriched to replace some of the nutrients lost in milling. The Food and Drug Administration has a standardized policy for foods that are enriched. Enriched flour must contain particular levels of niacin, thiamine, riboflavin, iron and folic acid, with the optional fortification of calcium and vitamin D. However, the healthy dietary fiber lost in milling cannot be replaced when enriching white bread. Getting those added nutrients naturally from whole-grain foods is healthier than from a supplement enriching your white bread. In addition, not all the vitamins and minerals or trace elements are replaced to make enriched white bread comparable to whole-grain bread. 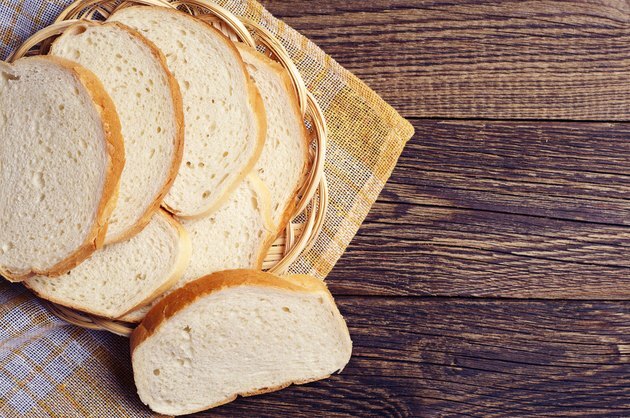 Specific nutrient profiles differ depending on the type of bread and manufacturer, but most enriched white bread often contains less vitamins A, E and B-6, and minerals magnesium and potassium, according to the Whole Grains Council. White bread, enriched or not, contains very little fiber. Fiber is important to your health and necessary for keeping your digestive system functioning properly. As roughage that your body can't digest, it helps move the food you've eaten through your stomach, intestines and then out of your body to keep you regular. Fiber helps avoid constipation by softening and adding bulk to your stool and may also decrease your risk of developing hemorrhoids and diverticulitis, according to Mayo Clinic. In addition, fiber may be an important factor in lowering your risk of colorectal cancer, according to a prospective study, published in the American Journal of Clinical Nutrition in 2015, that showed evidence that a diet high in fiber may contribute to a reduced incidence of colorectal adenoma and cancer. Read more: What Does Fiber Do for Your Body? White bread contains a high amount of carbohydrates, which your body needs for fuel. But not all carbs are created equal. To measure how fast specific carbohydrates cause blood sugar to rise after they're eaten, the Glycemic Index uses a numeric value on a scale of zero to 100. The higher the value, the more rapid the rise in blood sugar. When blood sugar is maintained at a relatively constant level, your body will perform best. White bread has a glycemic index rating of 70, which is even higher than honey or table sugar. Eating refined carbohydrates in white bread can cause a rapid glycemic response, which may initially increase your energy as your blood sugar rises, but this is followed by a cycle of increased fat storage and more hunger and cravings. Reaching for another snack may result in overeating and an increased caloric intake at the end of the day. If you are trying to lose that spare tire around your middle, skip the white bread. That stubborn fat may be what is known as visceral fat, a dangerous type of abdominal fat that can surround vital organs like your liver. A 12-week study assessed 50 overweight Japanese men to investigate whether white bread vs. whole grain bread had an influence on fat distribution. The results, published in Plant Foods and Human Nutrition in 2018, found the group who ate whole grain bread lost 4 centimeters of visceral fat around the middle, while the group who ate white bread showed no significant change. Because whole grains are considered healthier than refined grains, researchers used the two types for a comparison study on liver health. The liver is vital to metabolism. The aim of the study was to investigate the potential benefits of refined white vs. wheat bread (whole grain) and the impact they might have on the liver. Findings, published in the American Journal of Clinical Nutrition in 2018, were that the reﬁned wheat diet significantly increased liver fat. The indication was that refined grains may contribute to the development of nonalcoholic fatty liver disease. Conversely, the whole wheat diet prevented any increase in liver fat. The recommendation was to replace refined grains with whole wheat to maintain better liver health. White bread, as a refined carbohydrate, may contribute to cavities and other dental problems. A 2018 review investigated the role of rapidly digestible starches — refined carbohydrates — compared to slowly digestible starches — whole grains — on dental health. Researchers analyzed 28 studies and found that a diet consisting of refined grains led to a significant increase in cavities. Conclusions, published in the Journal of Dental Research, suggested that refined starch, and not slowly digestible starch, adversely affects oral health_._ Therefore, there is no advantage to white bread as a snack for children prone to cavities. Although white bread is tasty, those refined carbohydrates with a high GI rating may have a negative effect on your mood. The Women's Health Initiative participated in a cohort study in 2015 using high GI foods, with white bread as a baseline. The aim of the study was to see if there was a link between the consumption of refined carbohydrates — like white bread — and depression. The American Journal of Clinical Nutrition published the results, which found high-GI diets that include non-whole grains and refined carbohydrates were associated with increased risk for depression_._ The authors recommended further investigation to determine if low-GI foods could serve in treatment and prevention of depression in postmenopausal women. Wheat in white bread contains gluten, a type of protein that helps dough rise and gives it its elastic property. Some people are sensitive to gluten and cannot digest it properly, which causes stomach pain, diarrhea and bloating. A more serious autoimmune form of gluten intolerance, known as celiac disease, causes some people serious consequences from eating white bread or bread products made from wheat. If you have celiac disease and eat gluten, your immune system may respond by damaging your small intestine and inhibiting the absorption of nutrients, according to the Mayo Clinic. Healthy Grains Institute: What’s the Difference Between Whole Grains, Refined Grains and Enriched Flour? Is Wheat or Rye Bread Better for You?